I had left over fabric from the Coco top I made my mom (it hasn’t been blogged about yet, I was waiting until I finished her dress and blog all the Coco items together). Looking at the collection of doll clothes I have for my dad’s work, I decided I could use my extra fabric to make a top for the doll. Alright, once the top was done, I thought about the photos. I really didn’t want to use the skinny jeans. The left over fabric from Simplicity 2246 (chambray shirt dress) and the Sew Powerful purse was still laying on the cutting mat. I figured it would not hurt to make the skirt from the chambray to use with the top for photos. Another bonus is that they are both separates that will coordinate with the rest of the stuff. Let’s start with the top. This was easy to make. I basted it together on my sewing machine then ran everything through the serger. I will say that the pattern is very intuitive and I was able to put it together without the instructions. If I was using the lace overlay, I am not sure if I would have been able to do this without looking at the instructions first. I didn’t have a button that would work for this so I just used my Velcro instead. My sweatshirt doesn’t look as loose as the pattern picture. 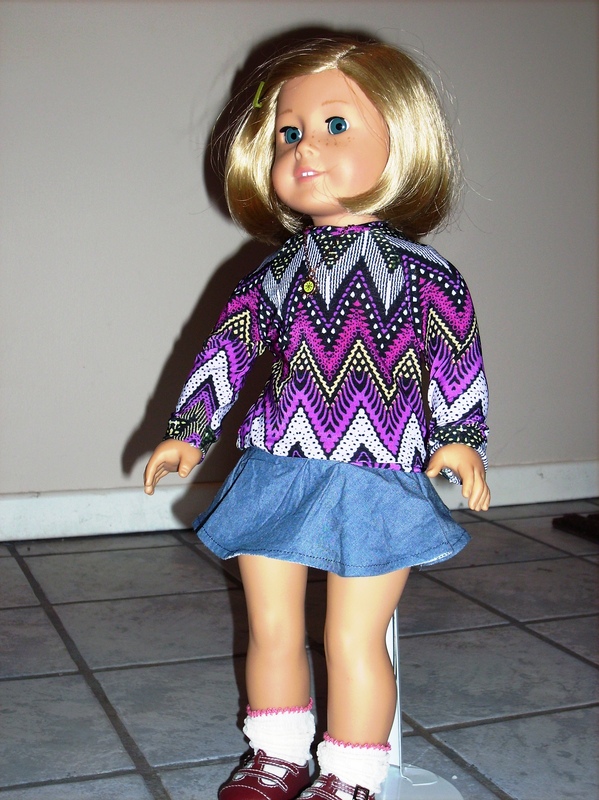 But realize that Kit is an older doll and she is chubbier. The Velcro may also be causing a difference in fit. The skirt was made with chambray, so maybe a little lighter than the leather called for in the pattern. 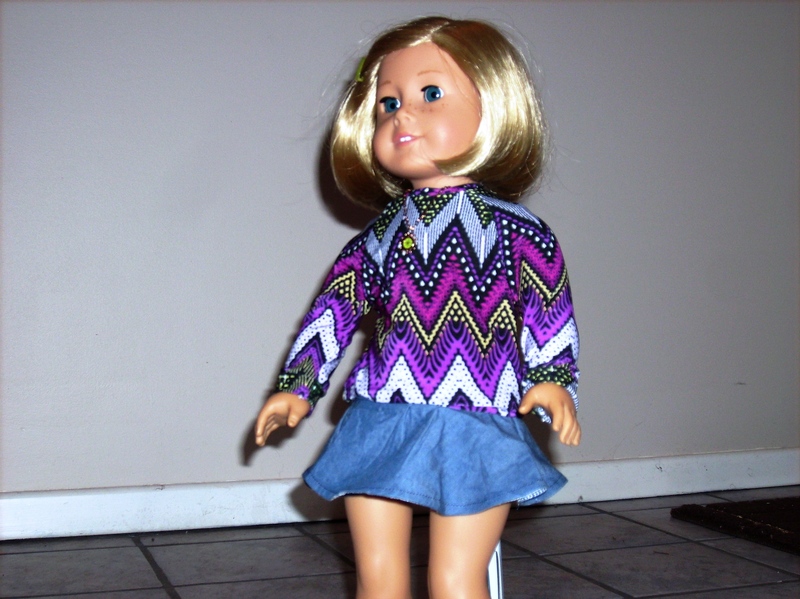 The pattern calls it a skater style skirt which looks very cute on the doll. I read the direction then got started on the skirt. I decided I wanted to try to use the rolled hem foot for my sewing machine. So I went ahead and did everything but the back seam. I used my serger for a majority of the skirt. I got to doing the rolled hem and had troubles trying to load the hem into the foot. So I went with the serged and turned under hem instead. I closed up the back seam and used Velcro instead of a hook for the closure. 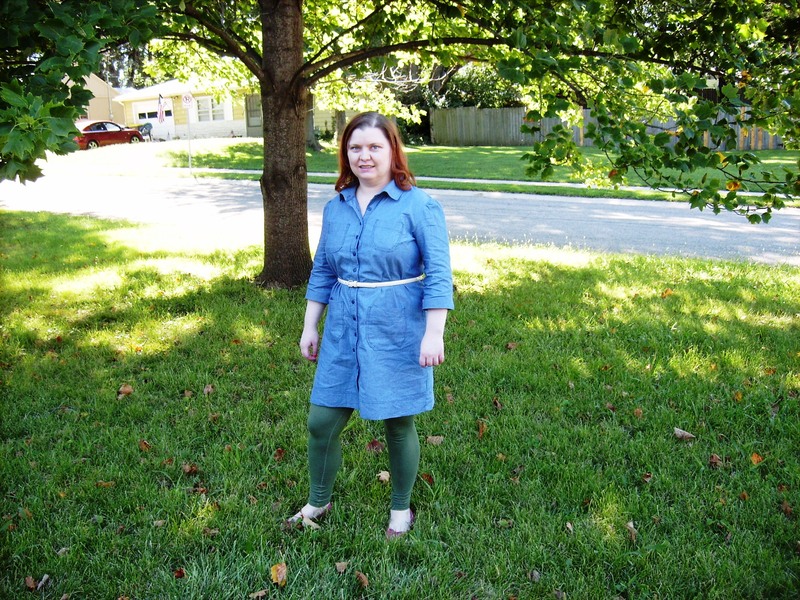 Looking a little more towards autumn, I thought a denim chambray dress would work out well. Early fall I can pair it easily with ballet flats or heels. Late fall it would look cute with colored leggings and boots. All around it should be a dress that I get a lot of use out of even to work. This should be the dress that almost didn’t happen. It seems like it was destined to be plagued with difficulties. I had planned this for the end of July for the pattern stash contest. The knit dress I made in July took longer than I had planned for, so I didn’t start this dress until August. First night was tracing the pattern and ironing out the denim chambray. There was a complication with the ironing; it was Lala. Somehow, he felt that he had to sit in the middle of the fabric and dig it up. Definitely not getting the wrinkles out. I kept telling the bunny that he has to smooth out the wrinkle not put more of them in. Lala was just not into getting wrinkles out no matter what I did. I traced out a 14 in the bust and shoulders then graded out to a 16 at the waist and hips. This time I resisted the urge to grade out further in the hips. I looked at the finished measurement of the hem and saw 51 ½ inches there for the 16. I figured the hip measurement couldn’t be too far from 50 inches. The pattern diagram didn’t really show too much flare at the bottom. I am happy with keeping a size 16 down to the hem and that was with trimming off about 2 inches and doing a 2 inch hem. As always I strayed from the instructions order a little bit, so on the second night of working on my dress I did all the stay stitching, bust darts, and shoulder seams together. The following night I set in the sleeves and pockets. Since I was working with chambray, I decided it was best to flat set in the sleeves before closing up the side seams. I wasn’t sure if the chambray would be as easy to set when the side seam were finished. The button placket was very easy to put on the front. Now it was time for the closure. It was a tough decision between snap or buttons. But I decided to use buttons. First off, I didn’t want to type cast my dress as a western as snaps probably would have. Most importantly, I thought the pounding in the snaps would upset Lala. I didn’t need him running through the house thumping a warning of danger. 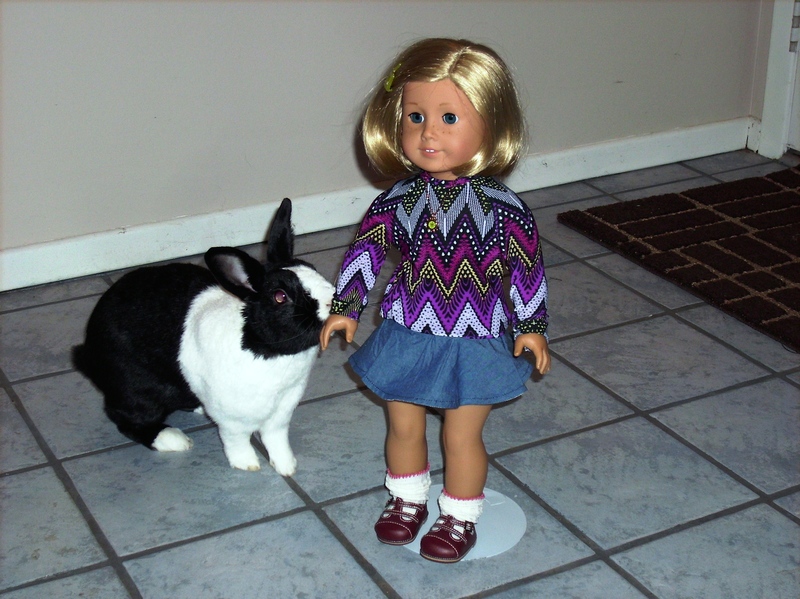 When a friend popped a party balloon by accident, it took two hours for the rabbit to stop thumping danger warnings and running around the house in a panic. So I brought buttons one weekend then decided I didn’t like them. Another trip to the fabric store and I got buttons I liked. Then I came down with pink eye. So button holes were just too much detail work when I was sick. I like to do all my button holes in one sitting if possible. I decided to make a maxi skirt instead. 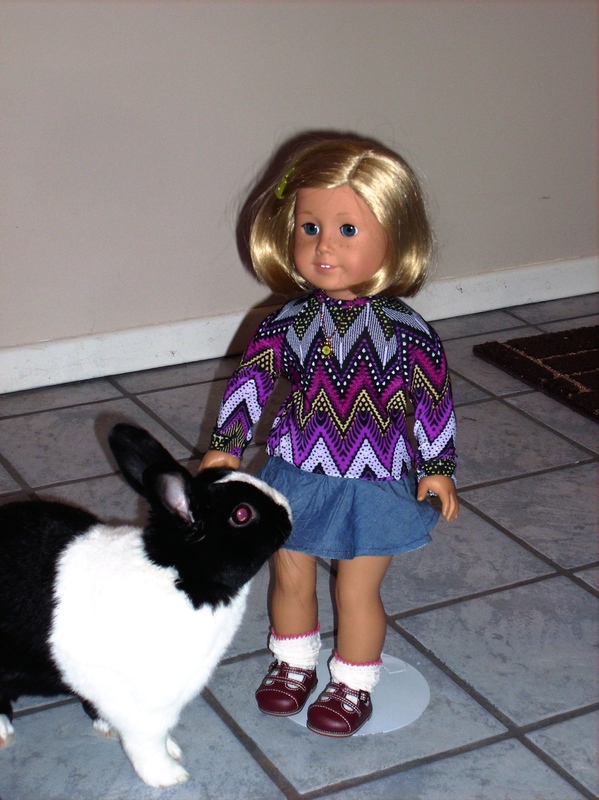 Then after feeling better I decided to keep to a simpler project and made the Tilly & the Buttons’ Coco dress. Finally after two weeks of delay, I come back to finish off this dress. My little Pfaff Ambition made perfect button holes for this dress (all 12, never had to pick one out). Machine sewing the buttons was a different story. Two buttons broke and I didn’t have extra buttons. The local fabric store didn’t have the ones I had purchased. I wasn’t going to take the 8 buttons off and replace them with something different. So I had to wait until Labor day weekend and try at a different fabric store. I was able to get more buttons like the ones I had! So this got finished after Labor day. My second hard decision with this dress was the sleeve length. Summers in Kansas can be way too hot and humid. Heat index becomes the weather person’s catch phrase. And it can be like this up until October. So part of me felt that the wiser decision would be the short sleeves which means I may get to wear the shirt dress more. But I really like the look of the ¾ length sleeve which means it will probably be limited to the autumn and spring times. In future versions (if that happens), I may look at changing the arm scythe slightly. It fits well, but certain movements make the sleeve feel restrictive. I think this is because the denim chambray doesn’t have stretch. The pattern may be perfect in a shirt style woven cotton with some stretch? 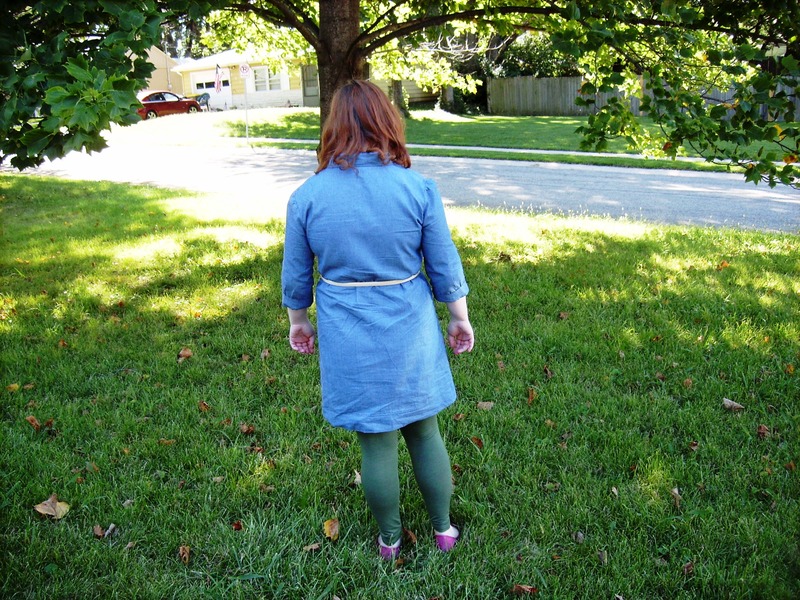 I did a quick google shopping search to see if there were any chambray dresses similar to what I made. I did find a couple and the price varied from $99 to $300. I did my search back in the beginning of August when I started my dress, so most likely the dresses have come down in price since then. I was able to make my dress for $40 in materials. I wanted to try out a new bead technique. So I choose the “Contemporary Corsage” pattern from Beadwork’s April/ May 2011 issue. 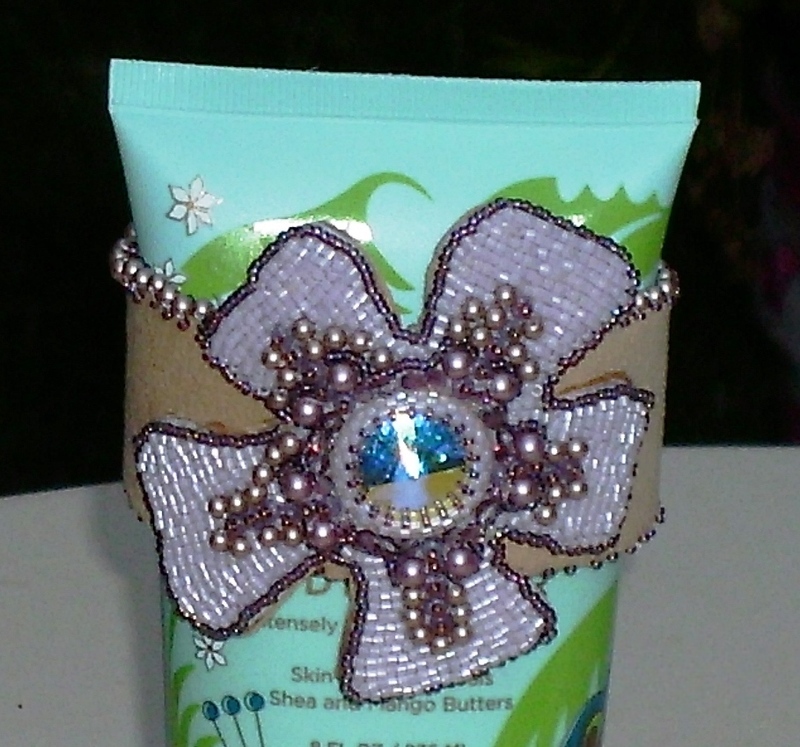 It is a cuff bracelet that uses bead embroidery, and peyote stitch (to secure the rivoli). Beadwork magazine rated this project 2 out of 3 beads. Accordingly, two beads means “Designs for an intermediate beader, a beginner ready to expand skills, or an advance beader looking for a project that won’t take weeks to complete” (pg. 95 on April 2011 issue). This is pretty accurate. I really didn’t have any problems with this pattern and I probably fall somewhere between intermediate and beginner. I just followed the material list in the instructions. I didn’t even use half of the beads I picked up for this project. The un-used beads from the material list include bead A, bead D, bead E, bead G and the 3mm bicones. I think I picked up 10 grams of the cylinder size 11 beads. Instead of using the white I had originally planned on for the petals, I switched it to the size 11 delica beads. To be honest, as I was putting this together, I think the pattern is overdone. There were just too many competing details. I ended up leaving off the picot fringe around the center crystal just because it looked like it would be too much. The bio for the designer did mention that she had designed jewelry for Steven Tyler, so maybe I should have expected it to be over the top? I haven’t done anything else from this designer so I am not sure if that is just her design aesthetic. Definitely read the instructions and decide what you want. The one part of the directions I don’t like is for the 3mm pearls on the flower. The instructions say to randomly place the 3mm pearls throughout the flower. But look that the picture, I don’t think those pearls were “randomly” placed. Also, there is no count on how many pearls to randomly place. 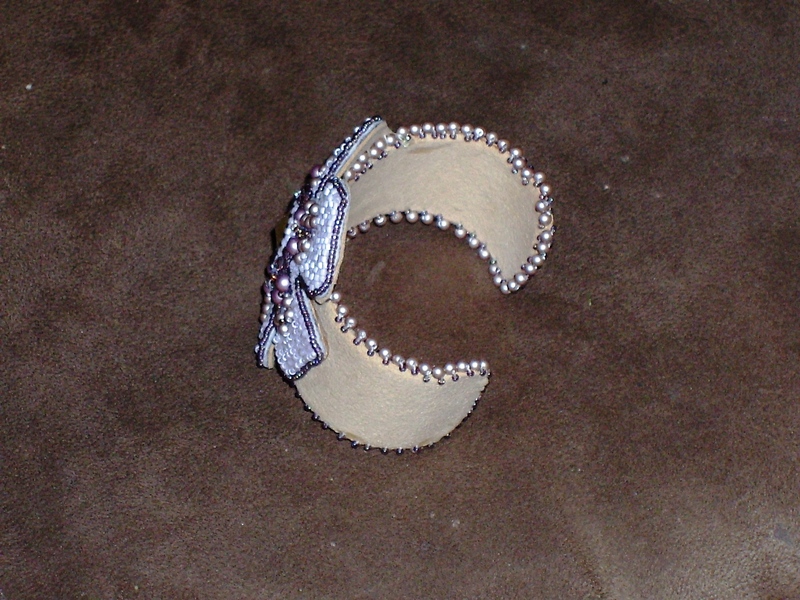 Some of the pearls are needed to edge the cuff part. So if anyone decides to make this, definitely consider doing the cuff part first so you have all the 3 mm pearls to randomly place over the flower without short-changing your cuff part. I still ended up with extra 3mm pearls after doing the cuff part of my bracelet. 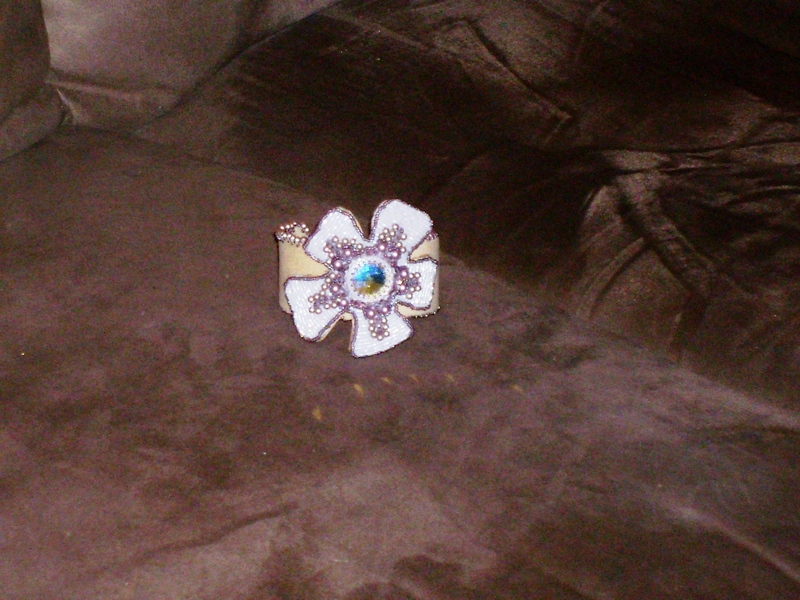 The pattern does say to glue the flower to the cuff then stitch it down. I found that I had a difficult time trying to get the needle to pick up just a little of the suede on the cuff. So I tacked down one end along the edge of the cuff instead. I plan on using the flower part again to make a brooch. I think the flower would look lovely on a coat or jacket.